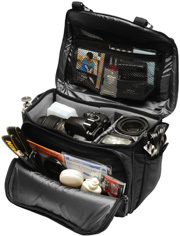 Protects your valuable digital SLR camera and accessories. The interior of this case is well-padded to protect against impacts and scratches, and features several adjustable hook-and-loop dividers, allowing you to customize the fit. In addition, there is plenty of room for accessories. 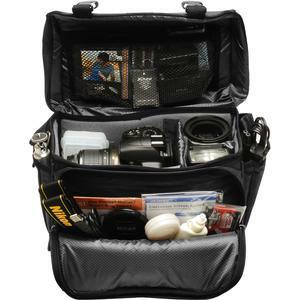 A zippered mesh pocket inside the lid makes for a great place to store small items such as batteries, memory cards, and filters while the zippered front pocket can be used for writing instruments, cables, cleaning kits and other items. 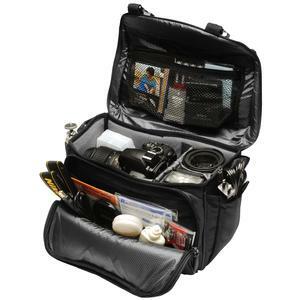 Two side pockets with hook-and-loop closures and a large pocket on the back of the bag are great for other items that need to be accessed more frequently such as instruction manuals and notes. 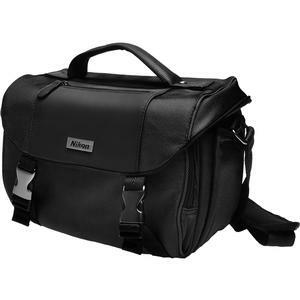 Finally, this case is secured with two heavy-duty clips for quick access, and features a soft handle and a padded, adjustable shoulder strap for portability. 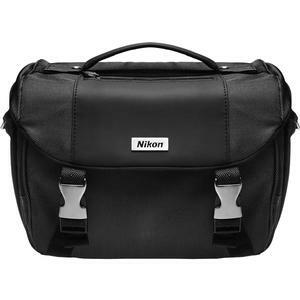 This case is perfect for beginning and advanced photographers alike!